This fabulous workshop is two-in-one, combining a victory roll class, and confidence class into one fabulous masterclass! This workshop will ignite your soul and leave you feeling beautiful and ready to face the world with glamorous victory rolls and newly found confidence. In the first part of the day will show you all you need to know to achieve beautiful pinup victory rolls, Miss Lady Lace will teach multiple methods and styling techniques, students will then have time to style their own hair with the assistance from Miss Lady Lace. 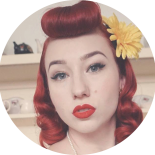 Once your hair looking wonderful the Confidence class will take place focusing on confidence and body image, looking at what it is to be confidence, ways to improve this, and focus on ways you can unlock your inner pinup! Places are very limited so be sure to book to secure your spot! ✦ Price: $30 per person, limited spaces available. ✦ Location: The Bassendean Hotel.